Etching and engraving, 888 x 485 mm. Bartsch 38; The Illustrated Bartsch 38; The Genius of Venice no. P52. Superb impression printed on three sheets of laid paper joined end to end, backed with a large sheet of laid paper. Collection mark stamped bottom right (Lugt 971). A watermark is visible above Saint Jerome’s hands when the print is held up to the light (the watermark may be on the print itself or or on the backing sheet): one-headed eagle in a circle topped by a crown (similar to Briquet 209; Verona, 1582-1596). Generally in good condition. The impression, trimmed to the subject, has the largest dimensions of all impressions we are aware of. Some skinning of the paper, two very small triangular losses of paper in the upper and bottom right corners, a vertical tear in the center of the bottom sheet. Horizontal central crease. Some surface dirt and yellowing of the sheet. Provenance: Friedrich August II (1797-1854), King of Saxony, Dresden (Lugt 971). We are aware to date of only five impressions of this print. Four are in museums: British Museum, Metropolitan Museum of Art, Bibliothèque nationale de France, Domschatz- und Diözesanmuseum Passau (Graphische Sammlung des Bistums; mentioned in Artificio et elegantia, p. 42, cat no. 8). One impression was sold on the American market in 2003 by David Tunick (quoted in Nouvelles de l’estampe, 2003, no. 185-6, pp. 77-78). According to David Landau, Battista Franco's Saint Jerome kneeling before a crucifix is “one of the most impressive etchings of the second half of the sixteenth century” (The Genius of Venice, p. 347). Gert Jan Van Der Sman says that Saint Jerome and the Crucifixion by Battista Franco mark “the high point of 16th century printmaking” (Le siècle de Titien - Gravures vénitiennes de la Renaissance, p. 140, [our translation]). These opinions bear on both style and technique. 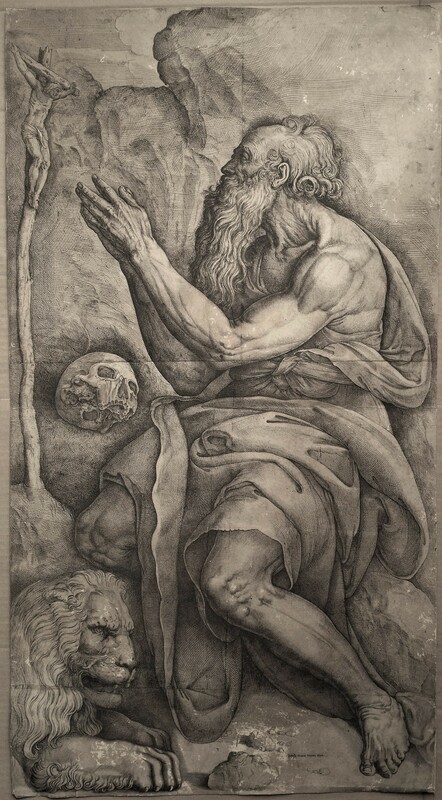 David Landau emphasises Franco's mastery in his Saint Jerome, offering a synthesis of the style of the two great Italian masters of his time: “the St. Jerome reflects both the monumentality of Michelangelo so much admired by Battista during his years working in Rome, and the impression that Titian’s works must have made on him when he returned to his native Venice in 1554” (Landau, ibid.). Indeed, for his Saint Jerome kneeling before a crucifix, Franco drew inspiration in large part from Titian's Penitent St. Jerome, painted in the 1550ies for the altar of Santa Maria Nuova in Venice (the painting is nowadays in the Pinacoteca Brera in Milan). 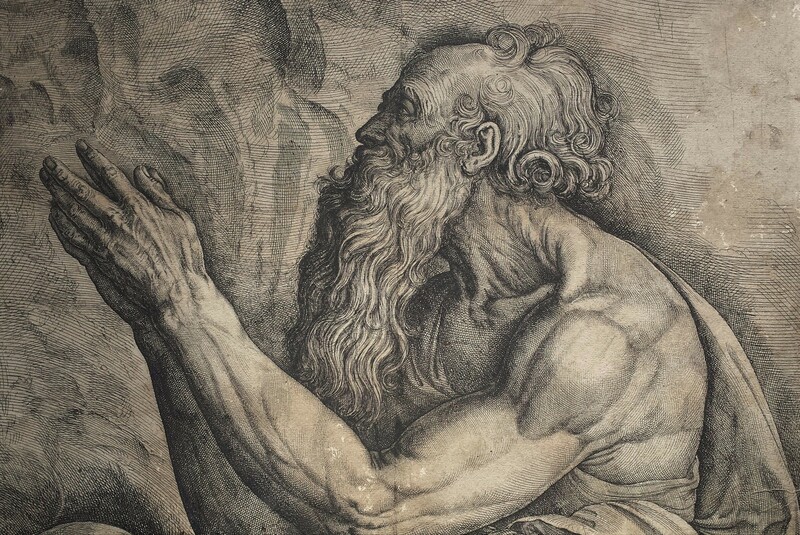 As for Michelangelo's influence, it is mostly felt “in the care with which the muscles have been sketched, and in the plastic effect of the torso” of the old man, according to Gert Jan Van Der Sman (Le siècle de Titien, p. 168, [our translation]). This masterful synthesis rests on Franco's much-celebrated - including in its lifetime - draughtsmanship, and on his mastery of etching techniques, which he developed primarily after he returned to Venice. 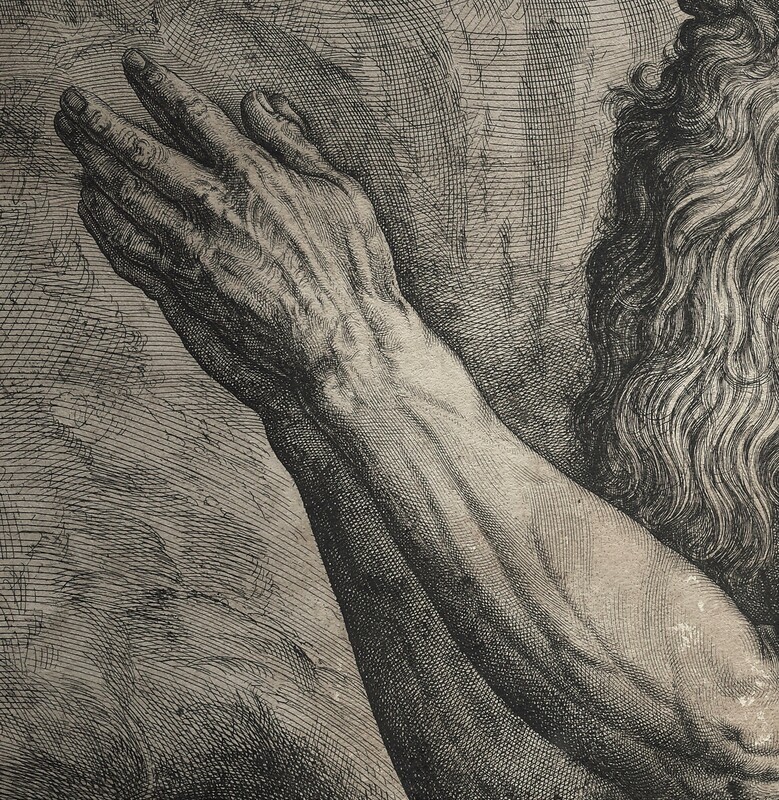 The power of Saint Jerome kneeling before a crucifix is born from the harmony between the strong composition and the graceful strokes that detail the hands, the face, the hair, the beard and the muscles of the saint. It is worth underlining the very large size of this work. David Landau insists: “In addition, this print is a monumental achievement from the technical point of view, for it is accomplished with a single plate, possibly the largest plate used in Italy in the sixteenth century : etching, engraving, inking and printing it must have posed many problems.” (The Genius of Venice, p. 347). 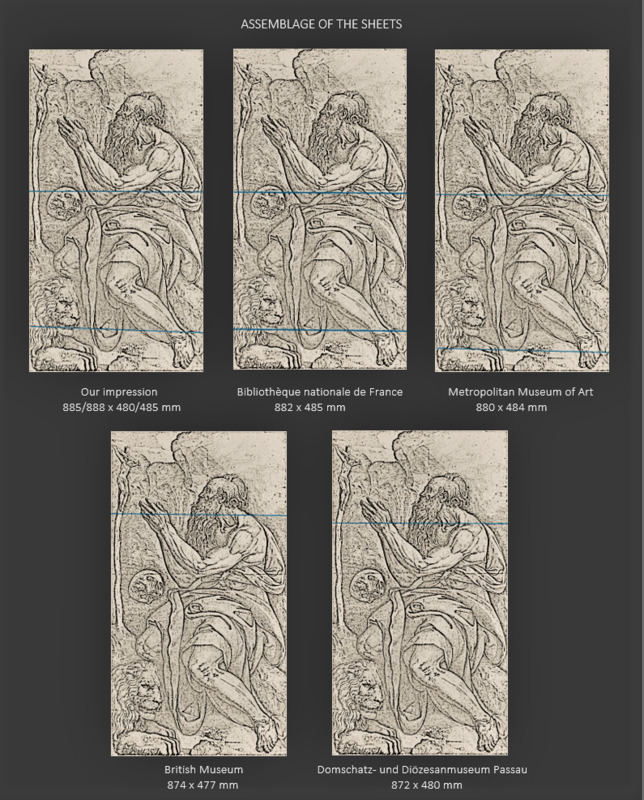 The impressions in the Bibliothèque nationale de France and the Metropolitan Museum of Art are composed like ours of three sheets which are joined at the same level to a few centimeters: a first horizontal line is visible at the height of the left elbow of St Jerome, a second line is visible at the level of his foot. The record of the impressions of the British Museum and of Passau mention only two sheets which are jointed, as we can see on the pictures, at the level of the hands. The arrangement of the sheets in both these impressions being different from that of the three other ones, it seems to confirm that Saint Jerome kneeling before a crucifix was etched on a single large plate. We are not aware of any impression that would have been printed on one sheet only. It is unlikely that the plate would have been printed onto one large sheet, which would then have been cut up in parts, instead of being folded. More probably the plate was partially printed onto several sheets that were then put together. On some impressions, there exists a slight mismatch in etched lines where two sheets meet: this clearly means that the work wasn't printed on blank sheets that would have been joined together before printing. On the impression that is in the Metropolitan Museum of Art, a few millimetres are even missing from the print where the two top sheets meet, reducing the height of the skull. References: Adam Bartsch: Le Peintre graveur, vol 16, 1818, pp. 131-132; The Illustrated Bartsch, 1978, p. 194; Jane Martineau and Charles Hope (edited by): The Genius of Venice, 1500-1600: Royal Academy of Arts exhibition catalog, London, 1983, pp. 346-347, no. P52; Gert Jan Van Der Sman: Le siècle de Titien - Gravures vénitiennes de la Renaissance, 2003, p. 168; Massimo Firpo and Fabrizio Biferali: Battista Franco «pittore viniziano» nella cultura artistica e nella vita religiosa del '500, Pisa, 2007; Anne Varick Lauder: Battista Franco, coll. «Dessins italiens du musée du Louvre», vol. VIII, 2009; Lea Salvadori (1991): 'Riflessioni sull'opera incisa di Battista Franco', Arte documento, 5, 148-57; Wendy Thompson: ‘An Unknown Portrait Series by Battista Franco’, Print Quarterly, vol. 26, no. 1, Mars 2009, pp. 3-18; Eckhard Leuschner and Alois Brunner: Artificio et elegantia : eine Geschichte der Druckgraphik in Italien von Raimondi bis Rosaspina, 2003.